do you think maybe his home is under a dirty bookstore in the valley? So a couple of people have been asking why I am so keen to get out of the current flat and find a shiny nice place of my own. At the moment, I would settle for a not-quite-shiny place so long as it wasn’t this dump. I think the following picture illustrates it pretty nicely. Today is rather wet. I had to go out, so took my umbrella to keep me as dry as possible. This proved to be a mission: impossible, but that’s for another time. Still, I got home, and needed somewhere to put the umbrella to dry it out. 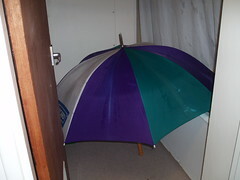 My room was out because there wasn’t going to be enough room for me and the umbrella, and I had work to do, so I put it up in the bathroom. And this is my small handbag sized model! *1*.